Good morning class, it is "Gaudete" Sunday. The word "Gaudeo" in Latin means "Rejoice". No doubt you noticed that we lit the Rose Candle on the Advent Wreath today. That's becuase we blend the white color of joy and expectation with the penetential purple color of preparation. This Rose Candle is the candle of "Gaudete Sunday". 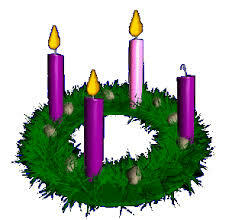 We celebrate the cardinal feast of the Third Sunday in Advent because of the nearness of the Holy Child of Bethlehem. By the way, Rose vestments were permitted to be worn this day in the church year; one of only two Sundays in the Church year when the color Rose is used. 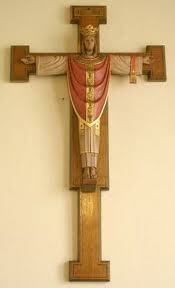 The other Sunday is "Laetare" Sunday. The word "Laetare" means as in the introit psalm for that Sunday"O be Joyful O Jerusalem". We celebrate that cardinal feast on the Fourth Sunday in Lent again because of the nearness of Christ's death and resurrection in Holy Week and Easter. The scripture calls on us to "Rejoice" this day. The prophet Zephaniah calls out to "Rejoice with all your heart O Daughter of Jerusalem." He goes on to say "The Lord is in your midst." In Philippians we read "Rejoice in the Lord always" and "The Lord is near". John the Baptist recognized the innate sinful nature of the human condition; he greets those following him with the words; "You brood of vipers!" He seems to have gotten up on the wrong side of bed that day except that he knew that those who had two coats were not predisposed to share with those who had none. He also knew that tax collectors tended to exploit their position in life by taking advantage of their power and taking in more than the just amount owed from the tax payer. Sound familiar? Likewise extorion from soldiers was not unusual, and on it went and when asked what was necessary for them all to repent, John merely said, do the right thing; share what you have with others, collect only what is owed to you, and be done with extortion and be content with your wages. He concluded the passage with the Gospel proclamation, and a joyful one it was, that the one to come after him would baptize us not just with water but with the Holy Spirit and with Fire. Rejoice then in the proclamation of the Gospel. Listen to it and proclaim it in your lives! These are the words of the Introit Psalm of Gaudete Sunday in ancient times. "Rejoice in the Lord always" and "The Lord is near". You meay notice that this joy comes to us at a dark time of year. Its not the shortness of the days that produces this darkness alone, but there are some dreadful events near and far away that reflect a dark dimension of the human spirit. The shootings in San Bernadino and Colorado among them. Good heavens there's even the business of a runaway train on the T. And much more darkness beside of allsorts. It is in the midst of this very darkness that we light this beautiful Rose candle and pray the Collect of the Day "Stir up your power, O Lord, and with great power come among us, and because we are sorely hindered by our sins, let your bountiful grace and mercy speedily help and deliver us". Sorely hindered by so many sins indeed. So much violence, so much hatred. So little love. Or so it seems. Particularly so when we spend too much time glued in to the media and fix our gaze on the chronicle of the sins of humankind, its violence and its hatred. Gaudete Sunday stands in stark contrast to all this sin. "Stir up Your Power". Yes, "because we are sorely hindered by our sins". "Stir up your power and come among us." This is precisely the promise of Gaudete Sunday. We have the promise of the nearness of God. In just a few short days we will celebrate the Birth of the Holy Child in the Manger. If we were to read our history books, we would notice that this is by no means the darkest of times. And if we read our Sacred History we may remember how heroicly our ancestors in faith faced the darkness with amazing transformational courage. 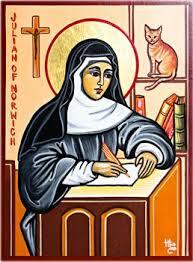 Take Dame Julian of Norwich for instance. Not a household name perhaps but familiar to all who study the history of Christian Spirituality in any depth. Dame Julian was born on November 8, 1342 and died in 1416AD. She was an anchoress. which is to say, she separated herself from secular society, not as a hermit, but as one set aside in a small cell at the church in Norwich, England. She devoted herself to prayer and Eucharistic life and made herself available to folks who would seek her out for spiritual guidance and counsel, through a small window in her enclosure. She was sought out by many because the times in which she lived were not just dark times but catatrostophic. The Black Death and the Peasant Revolts were the scourge of contemporary life for her and her beloved people. Contemporary theology was legalistic and judgmental. But Julian saw God as loving and compassionate and seeking the salvation of all. She was accused of believing in universal salvation. She believed that behind the reality of hell there was the greater mystery of God's love. She saw the universe resting in God's hands as it were a hazel nut, beloved of God, and that each soul within was the beloved of God. She is believed to be the first woman to have written a book in the English language. "Revelations of Divine Love" is a masterpiece of midaeval mysticism and I commend it to you for reading. There is an expression she used with quiet confidence to all who came to her, in whatever state of anxiety, fear, depression, guilt or despair. She very quietly assured all who came to her; "All shall be well and all manner of thing shall be well". Nowadays we might say; "Keep calm and carry on." But it is the same message. Our times may seem like dark times but when compared to the times in which Dame Julian lived and so many others, we certainly can rise to the occasion. Particularly so in our spirituality. We are called to Rejoice. More than that we are called to recognize the nearness of Jesus within our hearts and in the hearts of those around us. And so; "Stir up your power O God and come among us, and because we are sorely hindered by our sins come speedily with your Grace and Power." Listening to Jesus in a Time or Terror! Good morning folks. It has been one year exactly since I came to serve here in your midst. Thank you so much. You are such a joy to be with. There have been sorrows too, mind you. There have been a few trials and tribulations, but most of all, we live and move and have our being under the most gracious rule of Christ our King. Which brings us to this day; this moment. Imagine a world brought together under the most gracious rule of Jesus. Imagine a world filled with the Peace that passses all understanding which only King Jesus can bring. God knows I've never quite fully seen evidence of either the Kingship of Jesus or the Peace that passes understanding in the present time. In my own lifetime for instance, memory begins with the death of my father, the threat of Communism and McCarthyism, the Korean War, Brinksmanship in a Nuclear Age, The Vietnam War, urban guerilla warfare in Belfast, the struggles against Aparteid in South Africa, and of course the Arab/Israeli conflict in the powderkeg we know of as the Middle East. Afghanistan, Iraq, Iran are houshold words now; and terror strikes on 9/11 here, over the Sainai Peninsula a Soviet jet explodes, scores die in Beirut, and in Paris, hundreds more die, and now Mali! And on and on and on it goes. The most gracious rule of Christ the King and the Peace that Passes all understanding? How does that square with the reality we live with day in day out? Terror strikes and fear is the first to seize the hearts. Just as Mary and the Shepherds were seized with Terror at the enormity of it all so many years ago. They like us, were afraid. But the first message of the Angels at the Advent of Christ is "Fear not!" The message is the same at his death and resurrection; "Fear not!" Take heart and be of good courage. As the French would say "encourage" literally, "take heart". The French word for "heart", you see, is "couer". So how shall we come to terms with the Reign of Christ or understand the Peace that passes all understanding? It will take more than courage. It will also require intelligence. It is so easy to retreat into fear, God knows I can. It is so easy to give in to the rage that drives us to reprisal. And again we fall back into that tiresome ethic; "an eye for an eye; a tooth for a tooth" and the whole world becomes bind and toothless. Sigh! But what did King Jesus say? "Blessed are the poor and those who mourn." And most maddening of all, he says; "Love your enemies!" In our public, private, and religious life, it seems to me that very little credence is given to King Jesus and the more we live into the Presence of our history, the Peace that passes understanding seems further and further away from our grasp than ever. Instead we are surrounded by acts of terror and reprisal and I, like you, am tempted to throw up my hands in exasperation as we ask ourselves; "How does a Christian live in a world like this?" Before I give in to total capitulation, allow me to suggest that we return again to Jesus, as we struggle to come to terms with that question. OK King Jesus, show me how to do that! As I prayed thus this week in this dark and dangerous world, I heard an interesting little factoid on NPR (National Public Radio) that floored me. In Afghanistan, the government pays it soldiers about $400 per month to serve in the army and in its security forces. They are paid sporadically, if at all, they are poorly trained and equipped; and often even have to pay for their own ammunition and provide for their own weapons. On the other hand ISIS or DAESH or whatever these wish to be called, pay their soldiers about $700 a month. They pay like clockwork, train and equip their recruits very well with state of the art Kolesnikovs and ammunition, hand grenades, suicide vests and so on. They train the children from the age of 7 and teach them about Jihad and killing in the name of Allah so that a glorious Caliphate will be established around the world. A Caliphate, by the way is ruled by the successor to Mohamed. They begin by killing all other Muslims. Compare and contrast such a rule with the Kingship of Christ! It was an eyepopping education for me to watch a special edition of Frontline on Wednesday evening. Somehow an Afghan reporter was able to get inside the world of ISIS/DAESH culture and learn how its done. Imagine yourself young and afraid in a war torn world looking for a way to provide for your family. To whom will you turn? $400 on this hand working for the government? $700 on the other hand working for Allah in the glorious Jihad to establish a Caliphate to restore the rule of Mohamed to the earth. If we are to learn how to love our enemies, we'd first need get to know them better. In the world of "Realpolitik", a German word indicating the realistic art of political diplomacy, we begin with an intelligent approach to the complexities of our international situation. We will need to have some very skillful and intelligent leadership to engineer our way through this dangerous time in our history. In a democracy, that requires a well educated and intelligent public. In the meantime we live on in this world; a very real world indeed. As our national political life heats up in yet another electoral season, the world is ablaze with a struggle of a very complex sort. May I suggest that we all educate ourselves in the coming months so that we may cast our ballots wisely. Watching Frontline, for instance, which you can do from any PBS (Public Broadcasting System) website may be a beginning. But remember, intelligence requires study and homework. Our Civilization and our way of life is under attack. By the way, so is the vast majority of Islam. This tiny sliver of the Islamic world is, in no way representative of how most folks around the world serve and worship Allah. As we respond to the very real threat of ISIS/DAESH, we must be careful not to paint too broad a stroke as we respond to this very real threat. We the people must educate ourselves and be smart about it. The danger for Holy War and for yet another series of Crusades is real. It was not the point of Jesus to establish a Kingdom on Earth or for us to wage war in his Name. Rather, it is clear to the careful reader of Scripture that the rule of Jesus begins in our hearts. Jesus told Pilate in today's Gospel that his Kingdom is not of this world. His kingdom is of the human heart. It is within each human heart that the Reign of Christ is to be established. It is only here that Peace can take root even if it is a Peace that passes all understanding. The careful reader of the Hebrew Scriptures and the Holy Koran will come to very similar conclusions. All the Holy Writings require that we greet one another in Peace. It is the traditional greeting of Christians; Peace be with you. It is the traditional greeting of Jews; Shalom. It is the traditional greeting of Muslims; As-salam alaykum. 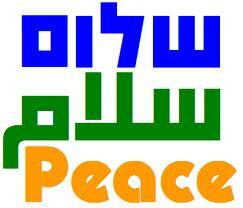 It is the ancient greeting of all three Abrahamic religions to the dwellers on earth and in Paradise. "Peace be with you." We crown the Christian Year now with a celebration of the Reign of Christ in our hearts. As I read the history books and as I read the papers, the greatest challenge of my life is to enthrone Jesus in my heart. And for us here at St John's, we do something as simple as fill out our pledge cards to demonstate that Christ is King in our Hearts and that His Peace remains firmly rooted within us.